San Antonio, TX— Ovation Brands’® portfolio of restaurants – Old Country Buffet®, Ryan’s®, HomeTown® Buffet and Country Buffet® – and Furr’s Fresh Buffet® are partnering with the popular anime and kids game BEYBLADE BURST for their latest Family Night promotion. The six-week series will feature BEYBLADE BURST-inspired activities and games for children to enjoy in stores, starting June 8, 2017. Family Night is every Thursday from 5-8 p.m. Activities may vary by location. BEYBLADE BURST is the newest generation of the BEYBLADE franchise and features action-packed games, toys, an anime series that airs on Disney XD, and apps supported by major mobile devices. Launched in 1999 by TOMY in Japan, the brand has gained worldwide popularity. Their toys are available at major retailers and the BEYBLADE BURST app is available for download on the App Store and Google Play. 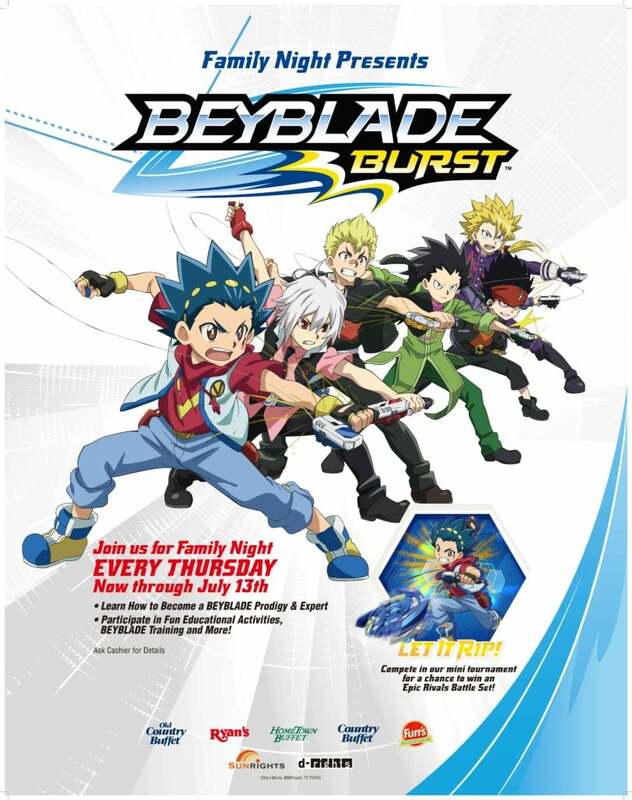 The BEYBLADE BURST Family Night promotion will feature different themes and activities every Thursday. Kids will enjoy Japanese-inspired fun with the following scheduled weekly themes. The final week of this Family Night promotion will feature friendly competition, when kids can face off in a BEYBLADE BURST battle. Plus, one lucky child from each restaurant will win a BEYBLADE BURST Epic Rivals Battle set. In addition to the fun and games, Family Night also serves up home-style meals for kids and parents to enjoy together. Every Thursday from 4 p.m. – close, kids eat for just $1.99 with the purchase of a regular-priced adult or senior meal. Menus may vary. Age restrictions apply. The BEYBLADE franchise was inspired by traditional Japanese battling tops called “Bei-Goma” and originally created in 1999 by TOMY Company, Ltd. as a modern battling top system. The brand has been an international phenomenon in over 80 countries, with two full generations to date, including seven seasons, two movies, and three spin off series. SUNRIGHTS INC., the fast growing New York based entertainment arm of Japanese production company d-rights Inc., will handle the distribution of broadcast, non-toy merchandising and promotional rights for BEYBLADE BURST outside of Asia. Learn more on BEYBLADE BURST’s website and social channels at www.beyblade.com, Facebook.com/officialbeyblade, Twitter.com/Beyblade_burst and Instagram.com/beyblade.official. Ovation Brands currently operates 109 restaurants in 31 states, principally operated under the Old Country Buffet®, HomeTown® Buffet and Ryan’s® brands. Furr’s Fresh Buffet currently operates 23 restaurants across 5 states. Visit www.OvationBrands.com or www.Furrs.net for more information.